Pair this simple grilled tuna and pasta with a crisp, refreshing white wine. Balmy summer nights are made for lingering over relaxed group dinners. That’s just how this recipe was created—cooking together with family and friends during a couple of leisurely evenings. There’s nothing fussy here to keep you from enjoying the night, just fresh flavors, prepared simply. And there’s no need to worry about the orzo cooling while you’re sitting around chatting, because it tastes great that way as well. Don’t stress about exact ingredients, either. It’s easy to make swaps in this recipe. If tuna is unavailable, use salmon steaks or another fatty fish. If you don’t have feta, shaved Parmigiano is also delicious. We sampled several crisp white wines alongside this dish, an easy thing to do during a convivial porch dinner. Among the contenders were a Sancerre, a Friulano and a Sicilian white. Quite a few wines worked very well, but the hands-down favorite was a Vinho Verde from northern Portugal. It would be hard to find a more perfect summer wine than a quality Vinho Verde. It’s crisp and refreshing, often has a light sparkle, and tends to be remarkably inexpensive. The bright citrus notes in this bottling perk up the fish and orzo with a nice lift, while the mineral edge leaves a clean finish that invites you to dive into the next bite. Vinho Verde also tends to be low in alcohol, making it an ideal sipper for long summer nights. 2. While the orzo is cooking, heat a small amount of olive oil in a sauté pan. Add the onions with a generous pinch of salt and sweat over medium heat until the onions begin to turn soft and translucent, about 5 to 7 minutes. 3. While the onions are cooking, preheat grill to medium-high heat. Oil the grates once hot. If cooking indoors, heat grill pan over high heat. 4. To the sauté pan with the onions add the tomatoes and two-thirds of the minced garlic, setting the rest aside. Cook over medium heat until the tomatoes begin to break down and turn saucy, about another 5 minutes. 5. While the tomatoes are cooking down, combine the reserved minced garlic with 1/4 cup olive oil and juice of 1/2 lemon. Add a liberal pinch of salt and pepper. Set aside. 6. Return the orzo to its pot and add the tomato mixture. Stir together over medium-low heat until combined and the orzo is al dente. Sprinkle the juice from 1 to 1 1/2 lemons over the orzo and toss lightly. Remove from heat. Toss with the feta and season with salt and pepper to taste. Keep warm until ready to serve. 7. 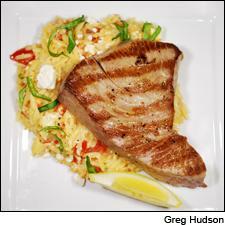 When the grill or grill pan is hot, drizzle or brush the tuna steaks with the oil-lemon-garlic mixture. Season steaks with additional salt and pepper if desired. Place the steaks on the grill and cook approximately 2.5 minutes per side for medium rare to 4 minutes per side for well done. (If tuna steaks vary in thickness, be sure to adjust cooking time.) Serve immediately. Tent with aluminum foil to keep warm for a few minutes if necessary. 8. Just before serving, toss the orzo with the basil. Serve with the tuna steaks. Cut the remaining lemons into wedges to serve on the side if desired. Serves 6 to 8.